On automobile assembly lines, much of the work is now done by robots rather than humans. During this process, a series of noise, weld spatter and accumulation of dusts creates one of the harshest working environments. Therefore, majority of automotive plant uses robots capable of finishing a single vehicle within a short period of time. Hence, the transport system needs to be extremely quick and able to stop accurately at certain check-points. 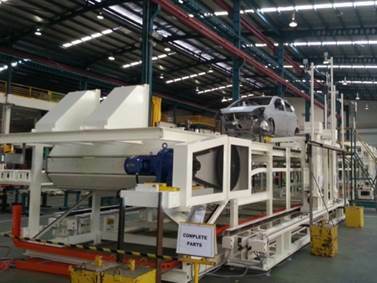 Cheng Hua offer side member automatic transfer system friction type and EMS transfer systems for chassis & under-body to assist in this process.